We kicked off 2017 CES with all kinds of new tech fun. We’re going in for various conferences over the course of CES and wanted to get a chance to hit some of the big tech booths. The Volkswagen exhibit featured VR through the updated HTC Vive equipped with front facing camera for picking up hand motions. They were showing off one of their new vehicles designed in the VR space. It was insanely cool. 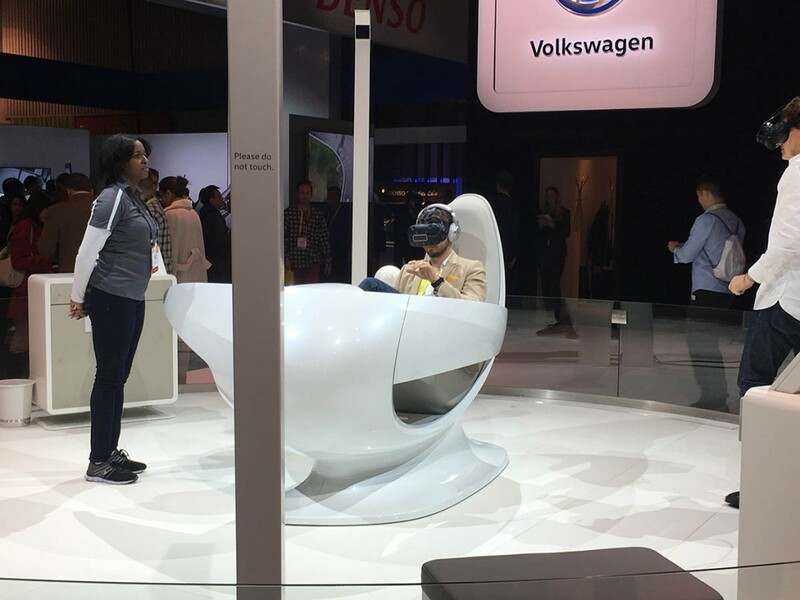 Props to Volkswagen for utilizing the new tech but their vehicle was sort of an afterthought to how awesome the updated HTC Vive is. The exhibit featured two demos, one seeing the outside of the vehicle, and one inside the vehicle. During the first demo, we got to walk around the vehicle and inspect it. The exhibit operator was assisting people walking around the floor while viewing. I can’t believe how natural it felt taking real world steps and traversing a virtual space. It was remarkable. The car stayed stationary and fixed in the virtual space as we walked around it. Buttons in the virtual space were lit up and the Vive picks up hand movements so we had a couple of different objects to “push” which changed up some various seat positions on the virtual vehicle. The second part of the demo featured sitting in the vehicle while driving through locations in Italy. It was a mix of the 3d rendered vehicle and 360 video footage outside of the vehicle for the simulation. This was also very well done. There were virtual buttons for selecting music and ambient lighting. Being able to look around the inside of the vehicle while driving was very cool. The demo and hence the HTC Vive left me completely impressed.